the bottom image shows how to connect the device to the UDK2. 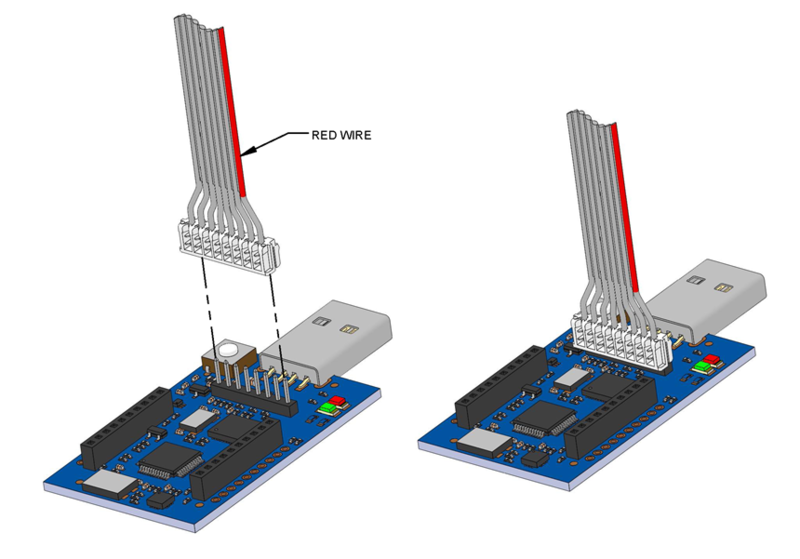 As shown above, connect the device to the MDK or UDK2 using the 8-pin flat programming or ribbon cable (with its red stripe facing you). Power on the device. LED1 turns green on with blank screen. 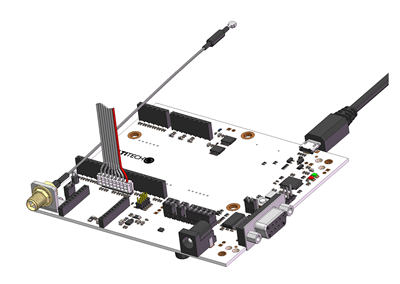 Connect the MDK or UDK2 to a computer (via its USB connector). Note: The UDK2 does not require an external power supply as it is solely powered via USB. LED1 turns red and LED2 flashes blue. Menu displays on device. 3. Your PC automatically detects the device and mounts it as a MULTITECH mass storage device. 4. Download the binary file (which is different from the file in this animation) from http://www.multitech.net/developer/downloads/ under the MTDOT-BOX/EVB. Copy the MTDOT-BOX-EVB-2.1.2.bin file to the MULTITECH drive the same way as shown below. 5. After the MDK’s or UDK2′s red and green LEDs stop flashing, use the MDK’s reset button to reset the device. (Note: the MDK reset button resets both the MDK and the connected device. But the UDK2 reset button only resets the UDK2 itself, not the connected device. Before resetting the UDK2, send an ATZ command to the device to reset it.) This only applies using pre-compiled firmware that ships on the device, not custom mbed application. 6. Select Configuration on device menu and open a terminal emulator program on PC. To configure the device using AT commands (while connected to an MDK or UDK2), refer to Configuration Mode for details. Unplug the MDK/UDK2 from USB and plug it back in. If using UDK2, disconnect the USB cable and power supply. First, reconnect the power supply, and then reconnect the USB cable. Cancel any driver installation prompts. The MDK/UDK2 mounts as the MULTITECH drive without drivers.